Before we touch on the benefits of direct marketing, it’s a good idea to summarise what direct marketing actually is. Our existing clients understand what a powerful tool direct marketing is, but it might be that you haven’t yet employed direct marketing for your business. Direct marketing (DM) is about identifying and then making contact with people who you think will respond to what you are promoting. DM enables you to directly target particular people with a message personalised to them. Moreover, direct marketing when employed successfully triggers a response or action from those you have chosen to target. So your DM campaign would have a clear call to action which supports what it is you are trying to do (e.g. boosting sales revenue, increasing customer loyalty, generating new business). Not so long ago direct marketing was face to face, telephone based or print based (e.g. direct mail and leafleting). However with the advent of our digital age other avenues to your new customers appeared; for many email became the channel of choice, and more recently, mobile and SMS marketing have become attractive. For DM to have the most effect your campaign needs to target business contacts most likely to be interested in your product or service. Therefore your list of contacts needs to be at the core of a successful direct marketing strategy. Not only does it need to be made up of people who are likely to be interested in your what you are selling, it must also be up to date and accurate. If your list contains mistakes or perhaps the names of people who don’t wish for you to contact them your results will be disappointing. Furthermore if your email addresses are incorrect your mail will bounce, or worse, you’ll be marked as spam and then risk being blacklisted by servers which means you won’t be able to email anyone. The targeted nature of DM means it can be extremely cost effective at generating sales and a powerful tool in your business’ marketing strategy. Concise IT generated £276,653 worth of business from the data they used, equating to a return on investment of £64 for every £1 they spent. in the B2B world you understand that sometimes it takes time to work with new clients; whilst they often come to us through word of mouth, there is often a ‘get to know you’ period during which we find out about each other. We provide lists but in doing so we seek to really understand what our clients are hoping to do. It’s also the case that often clients come to us with only half the answer. That’s why our Data Consultants pride themselves on our consultative style of finding out about you when we seek to discover what the plan is before we even try to select your list. We believe strongly that our aim remains to provide data which helps our clients generate an optimal return on their marketing spend. This means that we not only have to supply data which is accurate, up to date and detailed, but any list should be carefully selected to meet our client’s needs. Our clients get a better list and better results when working with someone here who knows the source database inside out. Data consultants apply themselves to all sorts of enquiries every day. From a typical day’s stream of enquiries, one or two always seem at first glance to be mission improbable! A few are, but we often get enquiries which need a bit more thought, and these come alive after casting an experienced eye over a request. Only then can we really see what we can do. One of our data consultants was asked if we could supply contacts within particular types of laboratories, and it soon became obvious that codes, categories and listings were of limited help. It may not have been a huge order but when it came to supplying the right list we had the ability to really drill down into our data when we needed to, which is why it is always so useful to engage with our prospective clients to understand them and what they want to do. Our telephone research calls not only generate “from the horse’s mouth” accuracy of contact and company names, phone numbers and email addresses but they also capture other detail which time and again proves immensely useful in making a relevant selection of business contacts. When we phone a site we always validate what the organisation does in real detail, and in doing this we create yet more searchable areas to improve the targeting of any list. If there is a point to be made it's that getting the most productive list is often the result of a good working partnership where our client permits us to really understand what they are trying to do. Need contacts in the marketing sector? Important to us, and maybe important to you if you or your clients work with companies in the Marketing and Media industry. We have them and because our telephone research checks them we get their details right. 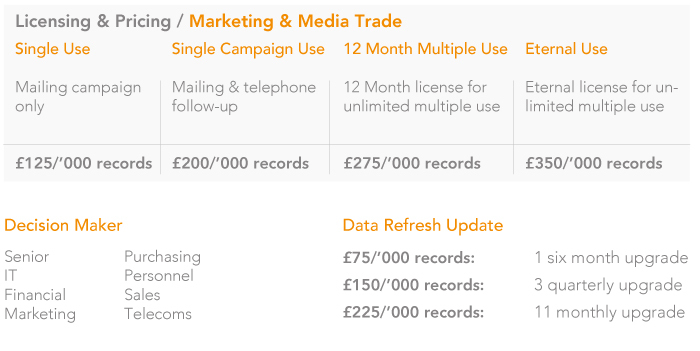 Speak to us about Corpdata’s Marketing and Media Trade; our comprehensive database from the largest to the very smallest marketing services companies. It’s one of the files where we tele-research detailed sub-sector information. So our clients can target their list using the activities listed below. The result is real detail helping you target the right companies and avoid the wrong ones.